There’s a scene around the mid-way point of The Program that shows the film’s version of cyclist Lance Armstrong and his teammates lounging about, discussing a mooted biopic of Armstrong’s life. When talking about who might play him, Matt Damon’s name is thrown about, and then Jake Gyllenhaal’s, especially after one team member notes how in Donnie Darko he is first seen riding a bike. Armstrong then questions out loud whether that’s all he needs to qualify to play him on screen. The fact is, both the teammate and Armstrong are wrong. As it turns out, a name who wouldn’t have even been known at that point would be the one to eventually play Lance Armstrong, and what Ben Foster does is far more than cycle his way to victory as the disgraced athlete. The rise and fall story of Armstrong is so ripe for film that it’s almost a shame it didn’t come out any sooner, although given the story’s reveal only a couple of years ago we suppose it was only a matter of time. We follow Armstrong from his early days as a professional cyclist, including his publicised battle with testicular cancer, and using performance-enhancing drugs to cheat his way to victory in several Tour de France championships, all the while scheming and antagonising his way up to the top without ever letting anyone in on his private scandal – everyone, that is, except for sports journalist David Walsh (Chris O’Dowd) whose suspicions of Armstrong’s miraculous achievements lead to a lengthy investigation full of lies and questionable ethics. There’s no doubt that Foster is absolutely spot-on as the film’s interpretation of Armstrong, even looking too much like him it’s almost uncanny. The actor does a great job in bringing out such levels of despicability and hypocrisy in a real-life figure and makes the role almost his own, creating an anti-hero with Patrick Bateman-style indiscretions and insecurities (without the murders, of course). Also deserving credit is O’Dowd as the well-meaning but fierce journalist whose reporting on Armstrong’s infidelities lead to some fierce antagonism from the legal system and even his own friends, and the Irish actor sells the character’s desire for the truth to be revealed for the public’s and his own sake. Both actors excel here, but the biggest problem on display here is the film’s inability to find itself a reasonable emotional attachment that makes it all worthwhile. Armstrong in particular is thoroughly unlikable throughout, as was the intention, while there simply isn’t much with Walsh that warrants a connection other than he’s trying to tell his story. The closest we get to a pure connection with anyone in this movie is with Jesse Plemons’ fellow cyclist Floyd Landis, and he’s just as much a doping cheat as Armstrong (although his intentions are far more noble). The whole script, by Trainspotting’s John Hodge, is filled with characters like this who neither earn any connection nor have much character to begin with other than their most basic attributes, and Hodge’s lack of real revelations regarding the whole ordeal makes the film an empty retelling of facts we already know. This is by no means director Stephen Frears’ fault, either; as we’ve seen with The Queen and Philomena, he’s a talented director who knows how to direct actors like Helen Mirren and Judi Dench to career-best performances, and he more or less does the same thing here with Foster in particular. His direction is completely fine here, it’s paced well enough for it to pass as a decent thriller, but he’s still working with a script that, while an honourable effort, just doesn’t have the emotional weight to carry it all the way through as a narrative film, where we’re automatically meant to link with characters as opposed to a documentary where we’re watching real people talk about real situations. We wanted to like The Program more than we did, but in the end our thoughts on the film reflect our thoughts on Lance Armstrong himself: undeniably well-built, but ultimately soulless. 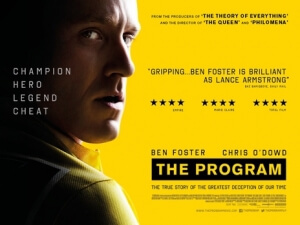 Although Ben Foster makes for a chilling Lance Armstrong, and director Stephen Frears does decent work as ever, The Program ultimately suffers from a script that offers nothing new about the controversy surrounding the disgraced cyclist, nor does it offer enough of an emotional connection to make it a worthwhile sit.